Published by College of Thelema (Los Angeles, March 2010), $156.00. A very special edition of a popular reference, crafted with unusual beauty. 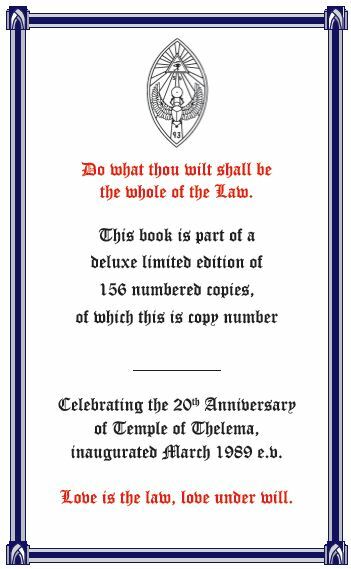 Celebrating the 20th anniversary year of Temple of Thelema, we are pleased to offer this deluxe limited edition of 156 numbered, signed copies of 776½ with premium design and manufacturing. This edition offers a red bonded leather hardcover with gold foil stamping, gilded page edges, Rainbow end leaves, and a mounted bookmark ribbon. Manufactured with acid-free paper and binder boards, and with superior binding (Smyth-sewn signatures), this volume will last for generations. A special numbered commemorative page, signed by the author, certifies the uniqueness of this edition. This limited edition is available by direct order from College of Thelema. NOTE: As this is a numbered limited edition, you may request the number (from 1-156) that you want. If possible, we will accomodate your request. You may list up to three preferred numbers, in the order of your preference. If none of your preferred numbers is available, the next available number in sequence will be shipped.